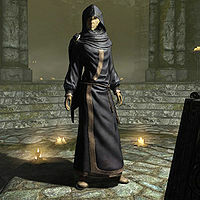 The Caller, an Altmer elemental mage, is the leader of a band of mages in Fellglow Keep. Unlike the rest of her group throughout the dungeon, she will not outright attack you on sight. As explained by Orthorn when you find him in the keep, The Caller is in possession of the three books that Orthorn stole from the College of Winterhold, namely Night of Tears, The Last King of the Ayleids, and Fragment: On Artaeum. He mentions that she was especially interested in one volume in particular, though he neglects to tell you which one. As a key character in the quest Hitting the Books, she will remain standing at all times at her podium in the Fellglow Keep Ritual Chamber. She wears blue mage robes and a pair of boots. She knows a number of leveled spells from the schools of Alteration, Destruction, and Restoration. Upon entering the final chamber of Fellglow Keep and meeting The Caller during the quest Hitting the Books, she will immediately engage in dialogue with you: "So, you're the one who barged into my home and laid waste to my projects. How nice to meet you." If you ask her who she is, she will say: "Names no longer matter. You may refer to me as The Caller. Now, do you have a reason for making such a mess?" You can then explain that you're there on behalf of the College to collect the books she's holding, and she will respond: "So you're just one of Aren's lackeys? That's disappointing. You show real promise. You come here, kill my assistants, disrupt my work... You've annoyed me, so I don't think I'll be giving you anything." Perhaps we can come to an arrangement. Passed: "An arrangement? After you've destroyed so much? Fine. Leave me the elf. You may go with your books." Let me leave with the books, and there won't be any more trouble. (Persuade) Passed: "Fine. Take them and be gone. Never return here, or else you'll face my full wrath." If you tell The Caller that she can have Orthorn, she will respond with: "Fine. Take your books and leave at once. If you ever come back, I won't be so gracious." Upon taking the books, if you go up to her and attempt to talk to her again, she will simply say: "You have what you came for. Now leave." If she becomes hostile with you after the conversation with her, you will have to fight her and two atronachs. She will randomly teleport and swap places with the atronachs during the battle. Her face and hairstyle are randomly chosen. Her dialogue suggests you've wiped out her entire band of mages whether or not you actually killed any of them. Paralyzing The Caller immediately as you initiate combat (with a weapon that has a paralysis enchantment, must damage for the bug to occur) will cause her to teleport and appear with paralysis still in effect, and it will stay in effect. Weapons will not damage her, and allies in the area will not register her as being there. Using the weapon you used to paralyze, you can spam attacks onto her without damaging her, and this is a decent, if not exploitable, way of leveling up weapon skills. This was tested with melee weapons, not bows/arrows. When finished, either "talk" to her, or use a spell to damage her, and she will register to your allies, who will attempt to kill her. She will take damage from spells and possibly weapons with damaging enchantments only, or will teleport again, which starts the process over. She will never recover from her paralysis. Casting Dead Thrall on The Caller, and later attacking her in an attempt to remove the follower, may cause her to teleport to an undetermined location. If this occurs, you may not be able to get rid of her as a Summoned Thrall (regardless if you have two other conjured followers), and as such people will always act as if you have an active zombie follower. It is possible that The Caller may have teleported back to Fellglow Keep where you first encountered her. If so, returning there and summoning another creature will dismiss her. The Caller can survive melee finishing moves if she teleports when they are triggered, even decapitations (she will continue to fight and cast spells despite being headless).